Soho: The reps at Delicatessen aren't spilling on what went down at the restaurant this morning—a reservationist told us she had no idea what we were talking about and that her manager hasn't surfaced in the last hour—but here's a little photographic evidence of the NYPD Blue presence at the Soho spot circa 10:30 a.m. 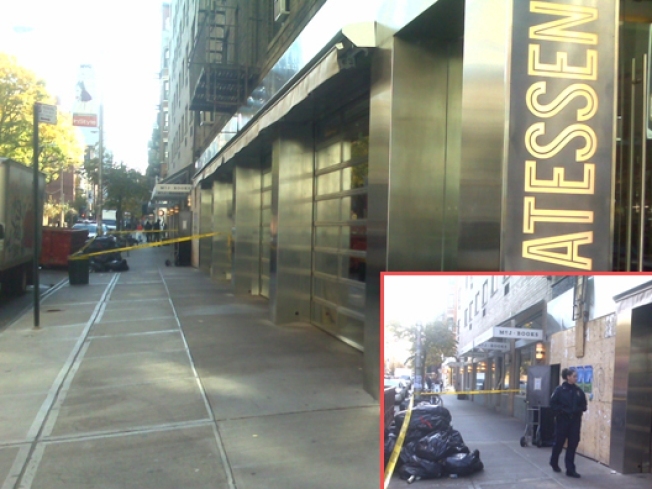 The delivery entrance on the Prince Street side was cordoned off with standard issue crime scene tape, while a police officer stood guard and staff sat out front waiting. At this point the staff has been let into the restaurant, and they are planning on opening up by 1 p.m. We're surprised those angry, water dumping neighbors haven't chimed in yet with the full story. We're always listening. UPDATE: Gothamistchecks in on the story, and it wasn't a filing cabinet that was outside (as reported by our tipster), but a SAFE: "Earlier an investigator was dusting the safe for fingerprints, as the white markings on the safe will attest." When asked what was going on, an officer cryptically replied, 'It should be pretty obvious.'"